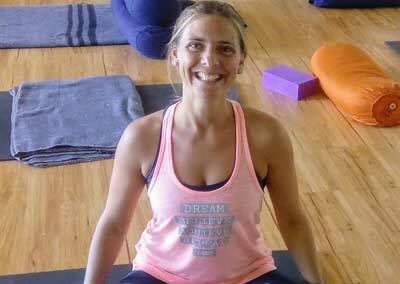 Lena is a yoga teacher, fitness instructor, massage and physiotherapist. Having grown up on an island in the North sea, she has a strong connection to beach and ocean. Maybe one of the reasons why she loves to flow through her Vinyasa practice so much. Daily Asana practice, Meditation and Pranayama in any places thinkable, have changed her life immense for the better and this is being reflected in her classes. Calm, patient and without expectations, she shares her knowledge and guides her students through their practice. Spending nearly 3 years in New Zealand at the early age of 16 created a deep bonding to this side of the planet. Living, learning, practicing and teaching in Byron Bay for over 1.5 years now, she is going to continue her journey in studying Shiatsu from December onwards. Sharing her passion for practice in a peaceful, at the same time strong way with focus on alignment and self-awareness, allows all levels to come together to connect. Enjoy a gentle wake up flow including Pranayama and Meditation. Let your body, mind and spirit get inspired by Lena’s unique touch of energy.